What they found was that the 2013 Subaru Forester was the most popular car that buyers are looking for this year. To gauge the popularity, they looked at visits to their model pages in the last 12 months from December 1st, 2011 through November 30th, 2012. The pages give road tests, reliability data, owner satisfaction findings, owner cost projections, and detailed pricing, as well as pictures of the cars and videos. The 2013 Subaru Forester was ranked number one as the most heavily researched car among subscribers in the new car category. Another interesting fact is that the top ten most popular vehicles are from Japanese automakers. The top ten new car list in order of popularity are the Subaru Forester, Toyota Highlander, Toyota RAV4, Hyundai Elantra, Honda CR-V, Toyota Camry, Hyundai Sonata, Acura MDX, Subaru Outback and Nissan Altima. So, what are car buyers looking for? According to the list, it’s clear that most consumers are interested in SUVs and sedans, and not so much hybrids or electric vehicles. For used cars, the top models are mostly from Honda and Toyota, with the Ford Escape being the lone domestic-brand entry. There are no hybrid or electric vehicles on the list of top ten cars in either the new or used categories. 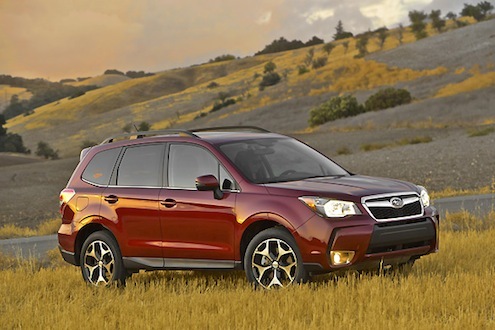 The all-new 2014 Subaru Forester will launch in the U.S. next spring and it looks like it could remain the number one car at Consumer Reports for 2013. The fourth generation all-wheel drive Forester gets even better for 2014. It features a newly designed exterior, roomier interior, improved performance and higher fuel economy across the line. A new 250 horsepower 2.0-liter direct-injection turbocharged Boxer engine leads the list of new features for the crossover and it will also be powered by a more fuel-efficient 170-horsepower 2.5-liter naturally aspirated Boxer engine. With buyers looking for good fuel-economy, the new Forester’s ratings will jump to the head of its segment in all-wheel drive fuel mileage. The 2.5 models with the automatic CVT will achieving manufacturer-estimated fuel mileage ratings of 24 mpg city / 32 mpg highway / 27 mpg combined. And while consumer reports don’t list safety ratings, the new 2014 Forester has been awarded the Top Five-Star Rating in the Euro NCAP Safety Test. This is the highest possible rating a car can get in the 2012 European New Car Assessment Program (Euro NCAP) safety performance test. It looks like the new 2014 Subaru Forester could remain the most popular car again for 2013 with all the new improvements made to the SUV.